Tired of the huge crowds at meals and during boarding? 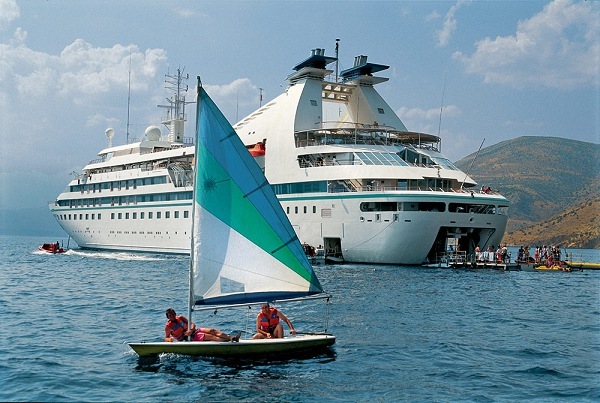 Windstar Cruises makes you feel like you’re on your own private yacht almost as soon as you step aboard.. Their Sea Breeze (above), is a ship large enough to pamper and entertain you, yet small enough to tuck into delightful tiny harbors and hidden coves that others can’t reach. With only 212 passengers there’s no hustle and bustle…just wonderful things to do. There aren’t any bad staterooms on this yacht. Choose from 106 newly refurbished suites, all outside with ocean views. The Owner’s Suites have private verandas, there are French style balcony suites and the Ocean View Suites feature picture windows. When you’re ready to make an appearance, the lounges, club, casino and library are waiting to be explored. Take some “you” time in the tranquil WindSpa…enjoy a dip in the pool…work off that decadent dessert in the Fitness Center…and, of course, you are always welcome to visit the Bridge to examine navigation charts with the Captain. All meals in all venues at all times, including room service menu available 24 hours. All non-alcoholic beverages, including cappuccino, espresso, and other specialty non-alcoholic drinks. Welcome cocktails at reception. Unlimited use of Fitness Center. Unlimited use of all water sports equipment. Save $$$ on this amazing cruise experience by booking with Teplis. As an example of the savings available the Venetian Passage, a 9 day cruise along the coasts of italy and Greece which normally sells for $7,199 per person is available NOW for $2,999 per person! Book by March 3 and recieve your choice of a Special Star Perk: Unlimited WiFi, Premium Beverages, Free Hotel Nights or Shipboard Credits (amount based on the length of your cruise). Call Susan in our Leisure Department at (678) 420-2510, Toll-Free: (800) 950-2950 or send her an email at vacations@teplis.com to take advantage of this incredible offer!